Welcome to STS Artic. Town! Our apps provide a highly engaging way for children to practice speech sounds using exciting, interactive stimulus items. The first of our apps includes practice for /s/ and /s/ blends (with more sounds coming in the near future). 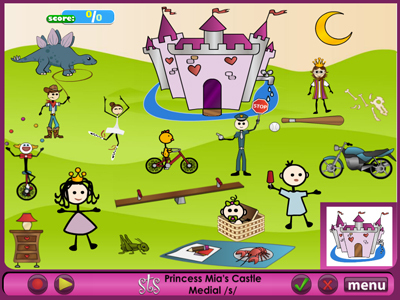 Children will enjoy interacting with our adorable characters in the amazing “SCENIC CITY.” Perhaps “PRINCESS MIA'S CASTLE” will catch your attention! 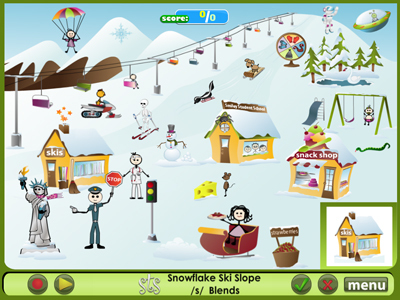 For even more exciting adventures, check out “KAI'S TREE HOUSE.” Finally, peruse through “SNOWFLAKE SKI SLOPE” and let Stan the Snowman show off his snowball-throwing skills. Under the direction of a certified Speech-Language Pathologist, children can use these apps in therapy, with a parent, or independently. The open-ended flexibility of STS Artic. apps provides endless therapeutic opportunities. Although these apps focus on practicing speech sounds, the creative therapist will find them useful for practicing a variety of language skills. Our “Create-A-Scene” option is the perfect way to combine practicing speech sounds with practicing the following of directions, increasing utterance length, increasing use of grammatical markers, increasing use of descriptors, and increasing vocabulary skills. These apps naturally provide opportunities for children to spontaneously generate phrases and sentences unlike other “canned” approaches. Other important features of this app include voice recording capability, scoring for data collection, and capability of e-mailing data. On each scene of the apps there are several interactive items. We have also included numerous pictured items in each scene that are not interactive but will provide many opportunities for additional practice and spontaneous speech productions. The scroll tool at the bottom right-hand corner of each scene contains pictures of all interactive objects. Scroll through the pictures and find the matching picture in the scene. Touching the picture on the scroll tool will name the pictured item. Touching the matching item in the scene with the picture on the scroll tool will create a fun interactive experience that is highly reinforcing! 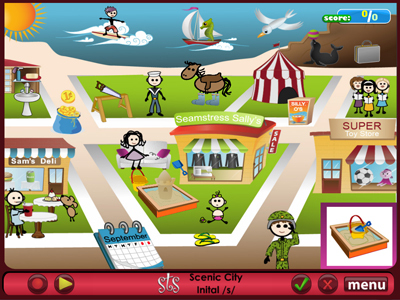 The “Create-A-Scene” option allows children to drag down and use the stimulus items within their corresponding scenes to practice words and/or generate spontaneous productions. This also allows the therapist to choose the needed stimulus items specific to individual children.